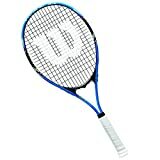 The racquet is designed keeping in view that the player should be able to fine-tune his/her game. The head size of this racquet is 107 sq.in, with a length of 27 in. The racquet is flexible and is able to effectively overcome harsh vibrations. 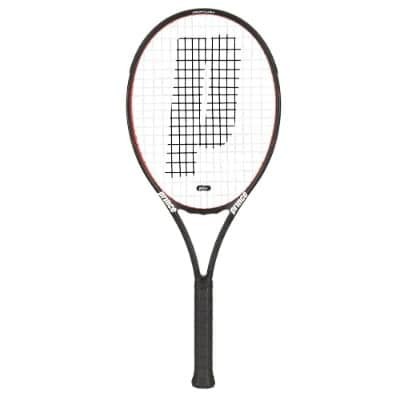 The string pattern for this racquet is 16 mains and 19 crosses with a strung balance of 13.1 inches. This racquet comes with three more grip variables including a grip ¼, 1/8, 3/8 and 4. These racquets are strung and ready to be used. The aluminium construction makes it sturdy yet lightweight. This racquet is available in four colour options including a black/yellow combination, green, purple and red. The size is oversized to ensure a good aim and ball placement. The racquet ensures stability while playing and has shock pads to ensure that the strings do not vibrate for maximum control. The racquet creates good spin shots. The grip is very comfortable ensuring that control and contact are perfect. The length of the racquet is 27.5 inches which provide the player with some extra momentum. The head size of this racquet is 112 inches, with a strung weight of 10.3 oz. The string pattern is 16 x 19. The V-Matrix technology makes the racquet a must have. This Graphene Touch Radical Pro has been endorsed by Andy Murray. The frame ensures maximum power and swing speed. This racquet comes with different grip size variable to make sure that you get a perfect fit for the big game ahead. 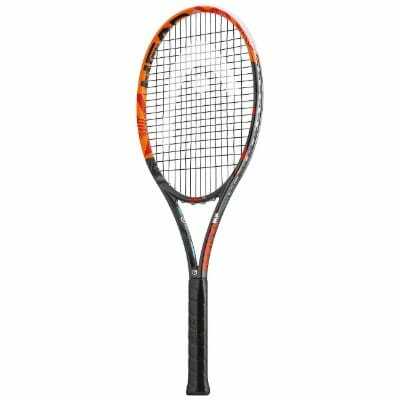 The racquet is designed while keeping a basic principle in mind “ the lighter the object, faster is the movement” The structure of this racquet utilises strong but light material thus ensuring that the racquet Is twenty percent lighter than other options. 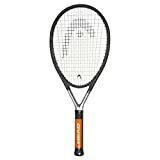 The power and the swing speed of this racquet make it an absolute favourite for players who are more into power quickies down the side-lines. The head size of this racquet is 98-inch sq, the frame (unstrung) 10.9 oz with a length of 27 inches. This hyper hammer comes in different variants with different grip sizes. The racquet is light and easy to control while making the bid for a perfect shot. The bubba tennis racquet has the largest legally allowed head-size of 137 square inches. This tennis racquet comes in five sized grip variants. This racquet is a champion with the best style and extreme ball movement control. 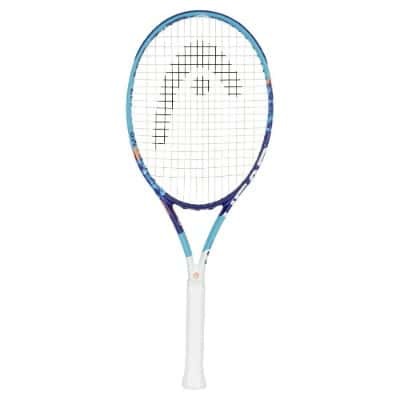 This beautiful racquet has a length of 29 inches with a weight of10.4 oz. this stiff racquet has a string pattern of 18 x 21 and is extremely suitable for short swings. The RZR technology incorporated in the racquet for aerodynamic movements including angled throat, grommet strip and the flush bumper. This racquet provides power to short swing and the bigger head size ensures that the aim stays accurate with a remarkable reach. This is ultimate racquet to aim for power and reach. This lightweight racquet can turn every shot into a power shot. The open string pattern featured by this racquet comes handy while playing heavy spin. The grip is anti-sweat, making sure that nothing affects your shot. The 115 sq. inch head allows maximum power in any shot. The SofTac grip is very comfortable and does not let the hands sweat. ShockStop reduces the vibration and ensures a smooth shot. The construction of this racquet utilises graphite and titanium which makes the racquet lightweight yet extremely powerful. This racquet is pre-strung and ready to be used in the court. 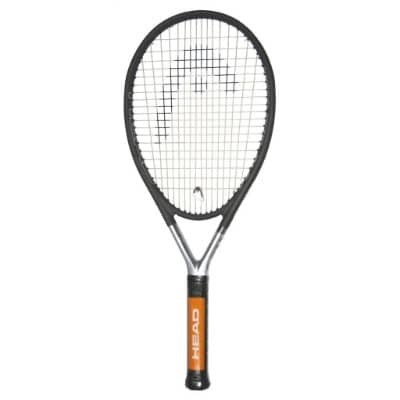 The ultra-light handle of this racquet facilitates a range of slow to medium swings. 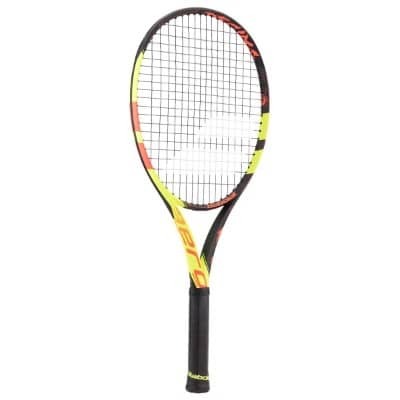 This racquet is a perfect mix of lightweight design, mobility, stiffness and power. Has a much better head speed, power, and maneuverability. Is very light but strong and is very easy to control. This racquet has a head size of 100 square inches and a length of 27 inches. The string pattern is 16 x 19, comes handy while opting for topspin or slice. The head is fabricated out of d30 which is considered a smart material and changes behaviour under impact or dynamic load. This material senses needs of the players and reacts accordingly. For example, in case of a high impact stroke, the molecules in the material realign to give the maximum power. This appropriately weighed racquet comes with an over grip. 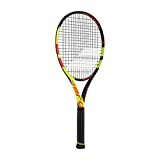 This racquet stands out of the crowd because of many things such as a unique 18 x 17 string pattern which ensures maximum boost and lots of control. Length of this racquet is 27 inches with a head size of 97 sq. inches and weighs 11.05 oz. This racquet is made out of braided graphite and the material makes sure that the frame is extremely strong. A dampener and over grip ensures that the play is comfortable and also makes the racquet easy to swing. Babolat Pure Aero Decima is a limited-edition racquet, made in honour of Rafa Nadal’s 10 Roland Garros titles. This request gives access to more power and devastating spin. The composition of this racquet is Graphite which makes it lightweight and sturdy. The head size is 100 sq. in with a length of 27 inches and a strung weight of 10 oz. This racquet employs the active cortex technology which eliminates vibration and shock and allows the player to play with cleaner impact. The Aero modular technology in the racquet ensures varying profiles around shaft, throat and the racquet head to reduce boost and drag. The cross strings come with wider spaces to get hold of the ball for a controlled shot. This racquet is an epitome of advanced control and the ball is going to follow its directions. On the top of the list of the best tennis racquets, this racquet is designed with aid of Roger Federer. The racquet is available in two different colors and bears an autograph of Roger Federer with his face laser-engraved. This is a treat for tennis fans and followers but besides that, the control of this request is praiseworthy. The racquet weighs 12.6 ounces and has a string pattern of 16 x 19. The head size of this racquet is 100 sq. inches and length are 27 inches. The composition of this racquet is Graphite and Tungsten. These racquets make the player court-ready and ensure an optimum level of power and spin, giving the player an edge over the component. A good racquet makes you feel a difference as soon as you lay hands on it. 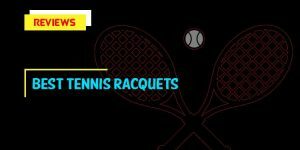 These Racquets are the best from the market and the user has to choose according to the level and category of usage. Professionals may handle a different racquet as compared to recreational players. The options are many and the choice is to be made according to power, spin, head size, strung tension, strung pattern, grip and so much more.